Welcome to the latest in a series of articles to do with enamelling and making jewellery. I hope you find them useful. I am writing about issues and problems I have experienced (and hopefully overcome), and tips and shortcuts concerning enamelling and making jewellery that I have come across in the course of the past twenty years or so. As I always tell my students, I have made most of the mistakes possible over the years. I am trying to share what I have learnt so that you don’t have to! In this post I am going to share some tips on using a piercing saw. 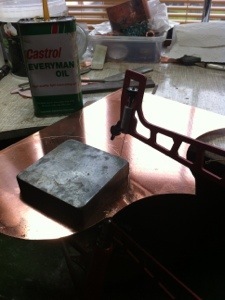 Today I was cutting out some clocks from a 30cm square sheet of 1.2mm copper. I use the 8inch Knew‘ saw to do this with either size 1 or 2/0 saw blades. When you are cutting out from a large sheet, there is a lot of vibration which makes it very tiring and can also break your blades. I find household oil to be very effective at lubricating the blade and reducing judder. I also put a steel bench block on top of the metal on the bench pin as this reduces the effort required to hold it down. You do have to be careful it doesn’t fall off as you manoeuvre the copper, but I do find it really helps. Have a go and let me know if you find these tips help you to cut out shapes from large sheets of metal.